Horses are complex creatures and learning to take care of them is an enjoyable, challenging lifelong process. To do it well, you must have a clear understanding of basic horse “design”; a familiarity with the resources available to you; good instincts and a willingness and ability to commit time, energy and money to the health and well-being of a large animal that must rely upon you entirely. In this article, we will introduce the concept of horse feeding. It is impossible to encompass the entire subject in one article because every variable in every situation alters the decisions you will make and the actions you will take. A firm grasp of the basics will always serve you well, though. Read on to learn more. 2 What Do Horses Eat? 2.1 What About Different Kinds Of Hay? 3 How Much Should You Feed? 5 What About Complete Feeds? 9 What Can A Horse Eat Safely? 9.0.1 1. Can horses eat bananas? 9.0.2 2. Can horses eat celery? 9.0.3 3. Can horses eat lettuce? 9.0.4 4. Can horses eat pears? 9.0.5 5. Can horses eat bread? 9.0.6 6. Can horses eat oranges? 9.0.7 7. Can horses eat apples? 9.0.8 8. Can horses eat grapes? 9.0.9 9. Can horses eat watermelon? 9.0.10 10. Can horses eat strawberries? 9.0.11 11. Can horses eat parsnips? 9.0.12 12. Can horses eat chocolate? 9.0.13 13. Can horses eat cabbage? 9.0.14 14. Can horses eat pumpkin? 9.0.15 15. Can horses eat potatoes? 9.0.16 16. Can horses eat broccoli? 9.0.17 17. Can horses eat carrots? 9.0.18 18. Can horses eat meat? 9.0.19 19. Can horses eat tomatoes? 9.0.20 20. Can horses eat peanut butter? 9.0.21 21. Can horses eat corn? 9.0.22 22. Can horses eat honey? Water is life, and it is the most important part of any diet. Just as with all living beings, clean water is absolutely essential to horses. Always provide a full trough of fresh, clean water. If you have a large trough that cannot be emptied and refilled daily, be sure to run the water over for 5 minutes or so every day to help displace old water and prevent stagnation. Scoop out any debris in the water using a small fish net. Empty the trough and clean it thoroughly at least once a month. It may be a good idea to invest into a good automatic horse waterer. Every aspect of every living body is dependent on proper hydration to function correctly. If your horse becomes dehydrated, it can cause problems in every element of his or her being from behavior to hoof structure. Be sure your horse always has access to ample clean, fresh, safe drinking water. Horses are designed to live on forage. Grass is the very best horse feed there is, and if you can provide ample, high quality pasture and fresh, clean water, you will really need to provide little else for a healthy horse. Good pasture in the spring, summer and fall and plenty of high quality hay in the winter time will keep most horses healthy. What About Different Kinds Of Hay? Just as with feed, the type of hay that is best for your horse will be determined in great part by the type of horse he or she is, the environment and the horse’s level of activity. If your horse is a high strung thoroughbred with a fast metabolism, you can and should feed a rich, fertilized hay which is a great feed for performance horses. If your horse is a backyard pet or a stocky, easy keeping weekend trail pony you should not. For general, overall good health the greater part of your horse’s diet should consist of natural, locally grown hay. Ideally, you should be able to provide this in ample amounts for free feeding in a hay net. In addition to free feed with local hay, one or two flakes a day of a higher quality, fertilized hay will provide more nutrition. If your horse has good teeth, is fairly young and is in good general health this may be all you’ll need for a balanced diet. While this is not hay, it is a very good source of roughage. It is a by product of beet sugar production. It is what is left after the sugar is extracted. If hay is limited, beet pulp soaked in water and added to the feed can provide needed roughage to keep the hind-gut active and engaged. It also provides a small amount of nutrition, but it cannot entirely replace hay. Most horses like it quite well. This is an extremely rich hay. While many horsemen swear by it, the fact is feeding it can be quite dangerous and can cause blood sugar level spikes that can lead to founder. Alfalfa is a very high protein type of hay that should be used only for horses with very high metabolism who are being worked vigorously (e.g. race horses, barrel racers, active hunter/jumpers, polo ponies). It can also be a good choice for a horse that is being rehabilitated from starvation; however, feeding this type of horse must always be done under the close supervision of a veterinarian. This is a very rich, sweet hay that is high in iron. Its appearance may be off-putting because it is very dark brown or purplish. Your horse is sure to love it; however, you should feed it very judiciously (if at all). Horses that are easy-keepers will tend to founder on clover hay. It makes a nice supplement for pregnant and nursing mares and older horses in need of extra nutrition. If this type of hay is available in your area, it is a good staple hay to free feed. It is nourishing but not as excessively rich as Alfalfa, so it will not present a high risk of founder. This hay is a bit lighter than Timothy. It makes a good, free-feed, staple hay; however, it may not provide enough nutrition. Mixing it with other types of hay is a good idea. If your horse tends to founder, keeping Timothy constantly available and feeding a richer hay, as needed, in measured amounts is recommended. This is a popular hay in the southern states where the soil is sandy. It makes a good staple hay to be free-fed if it is not fertilized. If fertilized, it may be too rich. 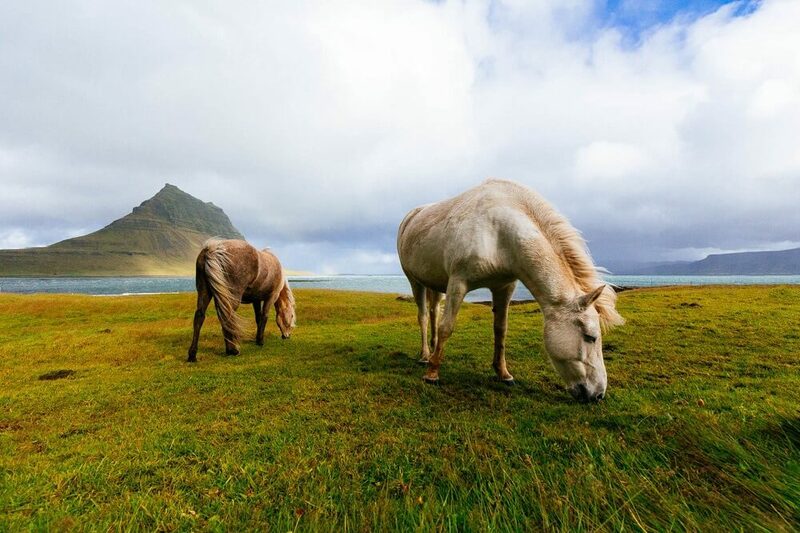 Horses tend to eat coastal very enthusiastically, and this can lead to colic. Using a hay net can slow down consumption and supports safer eating habits. A good, clean, mixed local hay can make a nice, affordable, everyday staple diet. Locally produced hay will include nutrients and pollen that will help your horse develop a strong immune system. This type of hay may be advertised as goat or cow hay; however, very often this just means that it is a natural prairie mix that has not been fertilized or sprayed for insects. If this is the case, this is a good thing! Eating a natural, organic diet is good for horses, just as it is good for us! To purchase this type of hay successfully for your horse, you’ll need to know how to evaluate hay. When purchasing from a local supplier, you should always see where the hay is kept and examine it before making a purchase. The hay should be stored indoors, and you should notice a clean, grassy smell. If you smell mold, be on your guard. Any amount of mold in hay is absolutely unacceptable. The exterior of the bales should be clean and perhaps slightly green. Open a bale and look at the interior. It should be clean, dry and fresh smelling. There should be no mold, dirt, dust or weeds. A good mixed grass hay may contain a mix of Timothy, coastal Bermuda, Orchard grass, clover and various native or naturalized grasses. Some examples include Sudan, rye grass and a variety of wildflowers and native plants. This natural mix is acceptable and even desirable as long as it doesn’t contain inedible plants, such as cactus, milkweed and the like. Ask when the hay was cut. You shouldn’t feed hay that is more than year old as it will have lost a great deal of nutrition and will be stale. If you find the hay to be acceptable, purchase a bale or two and give a small amount to your horse (half a flake or so a day) for a few days to see how he responds. If all is well, you can go ahead and make a larger purchase. When you don’t have access to unlimited grazing, it’s a good idea to keep a hay net filled with good local hay available to your horse at all times. 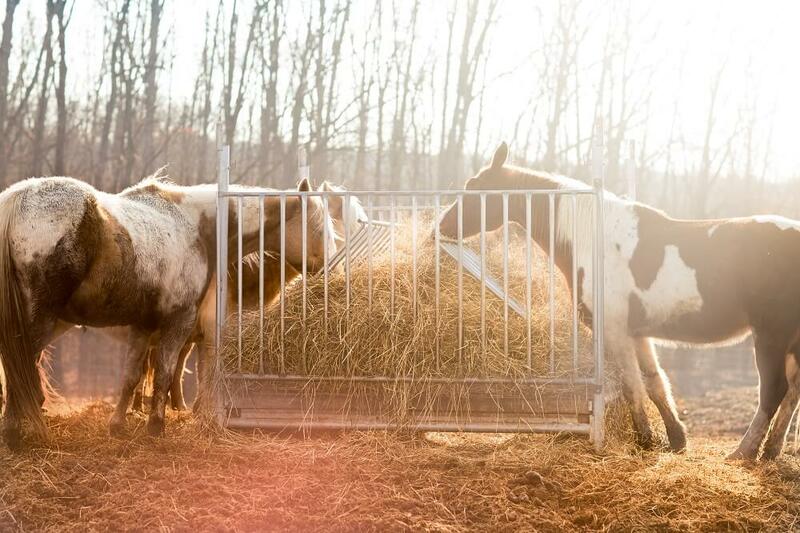 Hay nets help slow down eating (yes, a horse can eat too much hay) and give your horse more opportunity to digest. Additionally, they add interest to eating. The challenge involved in extracting hay from the net gives your horse something to do. Hay nets also help prevent waste by keeping the hay up off the ground. This means it won’t be trampled into the dirt. Your hay net should be securely tied to a post or to a rafter in your barn. It should hang at about shoulder level to your horse so that he does not have to reach up to access the hay. It should not be any lower than this because he may tend to paw at it and get his hoof caught in the netting. In addition to fresh water, ample grazing and good hay, your horse will need a salt supplement. Be sure to provide a salt block at all times. Purchase a large block and keep it in a raised and sheltered setting so it will stay dry. If you put your salt block directly on the ground or in a setting that is exposed to the elements, it will dissolve quickly when it rains. Salt blocks come in plain, sulfured and mineral varieties. Generally speaking, a mineral salt block is the most desirable. In addition to providing your horse with necessary salt, it also provides a good balance of essential minerals. In the spring and summer months, add a sulfur block. Sulfur in the diet helps repel flies and can reduce problems with internal parasites. A horse’s nutritional needs vary depending on the season, the weather, activity level and the animal’s age and overall health. If you don’t have a lot of actual experience with horses, it is wise to talk with local horse owners who do have experience and get personal recommendations regarding hay suppliers, feed stores, feeding habits and more. When you have decided upon a feeding regimen, it’s important that it remain consistent. Give any new feed plan 2-4 weeks before making any further changes. Keep a close eye on your horse’s condition and behavior during this time. When you make changes, only change one thing at a time and do so in increments. Making large, sudden changes can cause colic and/or founder. The bulk of your horse’s diet should be made up of fresh grass and/or hay. A horse should not eat a large amount of feed all at once. In the course of a day, you should feed a maximum of two percent of the animal’s body weight in feed and hay. If your horse weighs 900 pounds, you should not feed more than 18 pounds of food a day, the bulk of which should be hay or grass eaten in increments throughout the day. A horse should not stand around with an empty stomach waiting to eat a large meal. This will wreak havoc on his digestive system and his health. Understand that a number of health factors will affect your horse’s dietary needs. A horse that has intestinal parasites or horse with ulcers will not put on condition regardless of diet. A horse with bad teeth will waste a great deal of food (quidding in horses is a common issue). Energy – Fats, complex carbohydrates and natural sugars. Just as with people, horses need complex carbohydrates for quick energy. A horse that has access to ample grazing and/or free-feed hay will naturally get plenty of high quality carbohydrates. Other good sources of carbohydrates include grain, such as crimped oats, cracked corn and barley. High quality plant protein. Protein is essential for muscle development and sustained energy. A horse that is not getting enough protein will be listless and may have a rough, dry coat. Too much protein can cause founder. It is important that you feed the right amount of protein to match your horse’s metabolism and activity level. A backyard pet or horse that is only exercised occasionally will do fine with just 1.5% of his body weight in feed and hay daily. A show horse or race horse will naturally need 2% or perhaps even more depending on his metabolism. If you want to know how to purchase and measure grains separately to create your own special mix for your horse, that is subject in and of itself. Every horse is different, and the skills and knowledge necessary to self mix your feed take quite a bit of time, study and experience to acquire. While it is smart to read about feeds and become as knowledgeable as you can about them, the bottom line is that you should consult with your veterinarian when designing your horse’s diet. There are many good reasons to supplement your horse’s diet. Even in the best of climates, grazing availability changes with the seasons. Adding a supplement can help keep your horse’s diet stable throughout the year, regardless of availability of grass. Many good quality equine vitamin and mineral mixes are available to meet a number of specific specialized needs. For example, you may get specially blended supplements for hoof health, high performance, calming, prenatal vitamins, weight gain and a number of other purposes. Other types of supplements provide specialized nutrition to help repel flies and pests, to provide a shinier coat and more. Horses that are prone to anxiety (e.g. high-strung horses, mares in heat and horses that must perform or work under stressful circumstances) can benefit from supplements that provide extra B vitamins, magnesium and herbs to calm their nerves. Older horses benefit from calcium, MSM and glucosamine supplements for senior horses to help build strong bones and joints. Here is a good selection of top horse supplements for joints. Healthy fats are as important for horses as for people. While a horse does not need a huge amount of fats, a fat-free diet is definitely undesirable. Generally speaking, a horse will get enough natural fats from good quality hay and the right amount of grain. Supplemental oils can be added in the form of wheat germ oil, sunflower seed oil and the like; however, you should check with your vet and follow his or her instructions before adding any oils to your horse’s diet. Many people add canola oil to their horse feed; however, this is not a good idea. Canola oil contains omega 6 fatty acids which tend to cause and increase inflammation. This means that adding canola oil can cause an increase pain caused by problems such as arthritis, founder, colic and so on. Supplements can be very helpful, but just as with every other aspect of your horse’s diet you must be sure you are giving the right vitamins to attain the desired results. 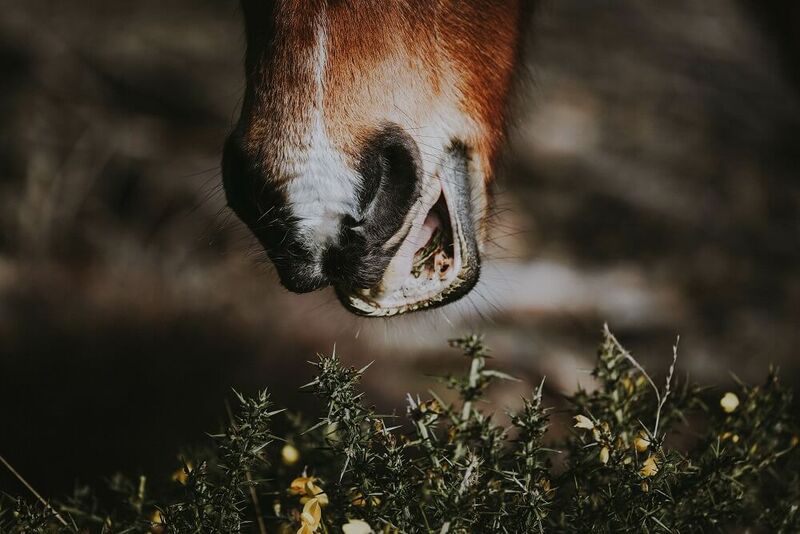 If your horse is getting ample high quality hay and proper feed and has access to a mineral salt block, he or she is probably getting all the necessary minerals; however, if your horse’s condition seems to be lacking, you should consult your vet about mineral supplements. You may need to have some blood work done to determine what may be lacking. Always discuss supplements with your vet before using them. While they can be a very good idea and very helpful, keep in mind that they are a fairly recent innovation. Before the advent of supplements, many horses did very well with a simple, balanced diet. You can do as much harm to your horse by overdoing calories and nutrients as you could by providing too little nutrition. If you are just starting out with horses, you may wish to begin with a complete feed from an established supplier such as Purina. This company makes a wide variety of complete feeds for horses of all ages and at all levels of activity. Feeding a complete feed makes it easy to calculate the amount to feed at each feeding. You simply follow the instructions on the back of the bag. Just remember that complete feeds are not really “complete”. These days there are many feeds that are devised to be fed exclusively. These types of feed claim to provide everything a horse needs; however, you should take this claim with a grain of salt. Horses always need hay, and a horse that is fed entirely on a complete feed will suffer emotionally and psychologically without access to grazing. A horse’s digestive system is designed for constant nibbling. There must always be some roughage in the hind-gut. Otherwise, the balance of intestinal fauna is thrown off and your horse will feel anxious and unhappy. 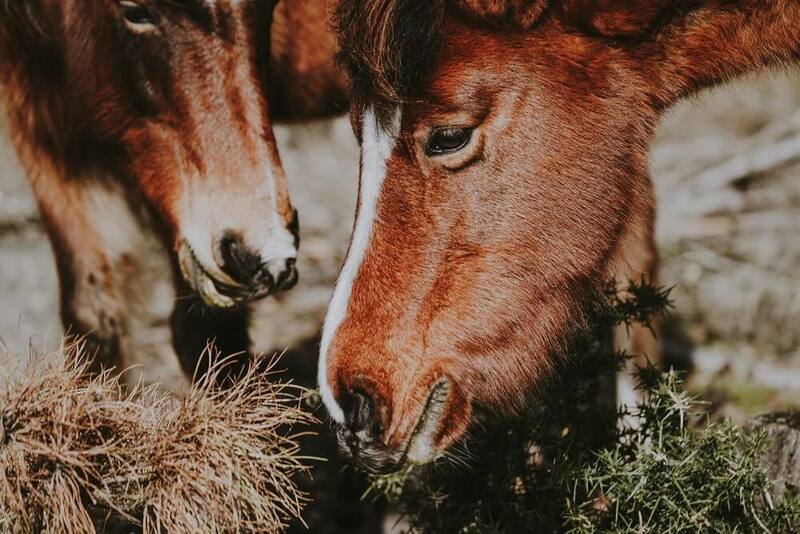 For this reason, feeding only a complete feed without hay and/or grazing can cause your horse to become ill and can lead to behavioral problems. Complete feeds do provide balanced nutrition and support for horses with specific needs; however, you should consult with your veterinarian before choosing a complete feed for your horse. A complete feed designed for a senior horse (for example) may not be appropriate for your senior horse if that animal has a high level of sensitivity to protein or sugar. Feeding this type of feed may cause your horse to have problems with laminitis. In this case, a feed especially prepared for laminitis prone equines would be preferable. Most complete feeds are alfalfa based, and this is fine for many horses (those with higher metabolism). You should understand that horses with a slower metabolism (easy keepers) may be very sensitive to any alfalfa based feed. Talk with your vet to devise a specific feeding program for your horse. This may also include supplements depending on your horse’s age, condition and the type of riding you do. A horse who is an easy keeper with a slow metabolism will need an entirely different diet than a high strung horse that has trouble keeping weight on. A back yard pet that is seldom or never ridden will need an entirely different diet than a barrel racer, active trail horse or a race horse. Just as it is a good idea to have a local hay source, it is also wise to choose locally produced feed if you can (assuming that your local feed mills are reliable and produce high quality products). Look for feeds that are made in your state with locally sourced grains. These brands will be fresher and more beneficial to your horse than international brands that may be made from grains sourced overseas. International brands often source ingredients from around the world. This can mean grains of inferior quality or processed in less than ideal conditions abroad. Locally sourced and processed grains will more naturally provide the nourishment your horse needs for your local climate. Additionally, being sourced closer to home naturally results in fresher product. If locally produced feed is not available, you will need to go with a national or international brand. There are a number of very good horse feed brands on the market today. Some of the top international brands are Purina and Standlee. When choosing, it is wise to consult with your local feed store and successful local horse owners. They will be able to tell and show you what works best in your area. Determining the right diet for your horse can be tricky. Begin by providing fresh water, a good mineral block and ample grazing and hay. This may be a perfectly adequate diet for your horse, but if not you will be able to tell right away. Keep an eye on your horse’s condition. If you start to see ribs, you know you need to provide a little more feed. A coarse coat, listless or anxious behavior, chipped, cracked hooves are also signs of lacking diet. Sometimes, just adding a flake of more nourishing hay will do the trick. Sometimes you need to add oats, grain and/or supplements for weight gain. You can feed your horse once or twice a day. The main thing to remember is that horses always need something to nibble on. Free grazing and/or free feed hay are very important. An empty hind-gut can lead to serious health problems, so your horse should never just stand around hungry waiting for food. Your feeding technique is also important. Always feed your horse in the same place (sheltered from the elements) at the same time every day. Never put feed directly on the ground. Your horse should have his own feed trough or dish. If you have multiple equines, set up a couple of hay stations so that one won’t be able to bully the rest away from the hay. The amount of feed provided should be carefully regulated and any changes in feeding should be made gradually. Sudden changes can cause colic and/or founder. Some horse have very high metabolism and need lots of hay and grain. Others are easy keepers and should not be overfed for fear of founder. The many complexities of horse feeding are the reason why it is very important to work with your veterinarian when devising your horse’s diet. Many new horse owners wonder if it’s alright to feed their horses non-horse type foods. While it is very tempting to give your horse all sorts of treats out of hand, and many are technically safe, you should keep in mind that this is not a good idea for a several reasons. Teaching your horse to associate your hand with food is a good way to lose a finger. Giving your horse frequent treats out of hand can spoil him or her and make him very demanding. A horse (even a mini) is not a dog. A demanding, spoiled horse can hurt you and be very difficult (if not impossible) to control. Horses have very delicate digestive systems. Feeding odd treats can make them ill, even if those treats are not technically poisonous. Store-bought horse treats are typically no better than store-bought cookies. They are junk food. Having said all that, if you are going to feed treats there are a few rules you should follow. Only feed natural or home-made treats, and only feed them as an addition to regular feed. Put your apple, carrot or homemade horse cookie on top of your horse’s feed in his or her dish. Don’t feed treats out of hand. What Can A Horse Eat Safely? Yes, bananas contain potassium, especially the peel, which most horses enjoy. 2. Can horses eat celery? Yes, but most of them don’t like it. 3. Can horses eat lettuce? Yes, all types of lettuce are safe. 4. Can horses eat pears? Yes, most tree fruits (pears, apples, peaches) are safe for horses. 5. Can horses eat bread? white bread is no better for your horse than it is for you. 6. Can horses eat oranges? Yes, but some don’t like them. 7. Can horses eat apples? Yes, most tree fruits are safe for horses. 8. Can horses eat grapes? Yes, but many don’t like them. 9. Can horses eat watermelon? Yes, even the rind. Cantaloupe, honeydew and other melons are also alright. If feeding the rind, be sure to wash it to remove any pesticide residue. 10. Can horses eat strawberries? 11. Can horses eat parsnips? Yes, they are similar to carrots. 12. Can horses eat chocolate? No, this is an entirely unnatural food for horses and should be avoided. 13. Can horses eat cabbage? No, horses should not eat cruciferous vegetables. 14. Can horses eat pumpkin? Yes, but most don’t like it. 15. Can horses eat potatoes? No, horse should not eat veggies in the hemlock family. 16. Can horses eat broccoli? 17. Can horses eat carrots? Yes, carrots are classic horse treats, high in vitamin A. 18. Can horses eat meat? 19. Can horses eat tomatoes? No, veggies in the hemlock family are poisonous to horses. 20. Can horses eat peanut butter? In small amounts, peanut butter is acceptable. A half peanut butter sandwich makes a good “pill pocket” for delivering medication. 21. Can horses eat corn? Yes, whole ears of corn in the husk can be eaten as long as the husk is not sprayed with pesticide. 22. Can horses eat honey? Consider honey as a possible supplement or addition to medicinal preparations and talk with your vet before using it. Generally speaking, very sweet foods should be avoided. Becoming a skilled horseman or woman is a lifelong process. If you want to do well, expect to read, talk with experts, watch videos and practice, practice, practice. There are lots of charts and graphs and software and tools available to help you take a scientific approach to feeding and caring for your horse; however, you should never underestimate the value of your own powers of observation. Make use of all the technology and all the knowledge available to you and watch your horse closely to get feedback from him or her. Discuss your challenges with successful local horsemen, watch the weather and follow your gut. Well-developed instincts and good horse-sense are a very big part of good horsemanship. All of this is great information when you want to learn about horses and what is required to care for them. I feel that many people jump into getting a horse without the realization of the information you posted here.